Question: What do Henry Ward Beecher (abolitionist), Leonard Bernstein (composer/conductor), Henry Bergh (founder of the A.S.P.C.A), Charles Ebbets (owner, Brooklyn Dodgers), “Boss” Tweed (NY political boss), Henry Steinway (founder of Steinway & Sons, piano manufacturers), and Samuel F.B. Morse (inventor of the Morse code) have in common? Answer: They, along with many other equally famous, infamous, and relatively unknown individuals are currently resting in Greenwood Cemetery, Brooklyn, New York – it being among the most noteworthy cemeteries in the United States. A scan over the list of those buried at this single location is quite sobering – causing one to pause and consider the hope for something beyond the grave. What inspired the above query? 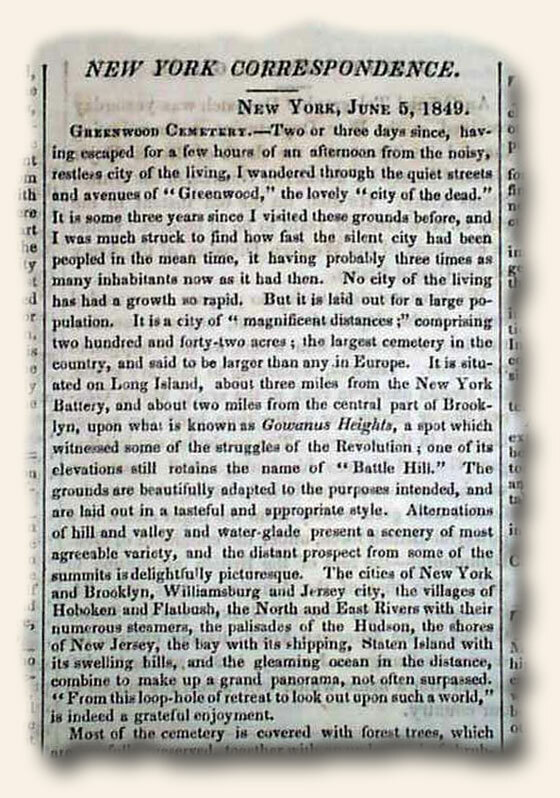 Trivia: No one with an arrest record was permitted to be interred at Greenwood Cemetery. This policy held true until the death of “Boss” Tweed, whose corrupt influence and power were apparently not buried with his remains. For much of the information below we credit John Oswald’s work “Printing In The Americas”. Printing in California began in 1825 when it was under Mexican rule, being not much more than engraved wood blocks used to make seal impressions. Some years later in 1833 with a new governor for the province an announcement of his arrival in California was issued, being the oldest known California imprint. As for newspapers, the very first published in California was on August 15, 1846 with the beginning of the “Californian” in the city of Monterey, just five weeks after the United States flag has been raised over the city and California was proclaimed a part of the United States. The newspaper was published by Rev. Walter Colton, a champlain of the U.S. frigate ‘Congress” docked at Monterey and a one time editor of the Philadelphia “North American“, and Robert Semple. On April 24, 1847 Semple became the sole proprietor of the “Californian” and two weeks later he moved it to San Francisco. The second newspaper in California was published as a venture of the Mormons. They created the “California Star“, the first regular number of which appeared January 9, 1847. On November 18, 1848 the Californian” and the “Star” merged, the name becoming the “Alta California“. Since the population of California was relatively small before the gold rush of 1849 newspapers from this decade are exceedingly difficult to find. They become much more numerous from 1850 onwards, but any title from the 1846-1849 period would be considered a terrific find by any collector. The piece shown appeared in the “National Intelligencer” newspaper of Washington, D.C., December 25, 1847, although as noted it was reprinted from the “Detroit Daily Advertiser“. Some curious comments on California.